It’s 3 in the morning and I have no idea why I’m writing this except to give my honest and professional opinion of the last Harry Potter movie ever. I will have to say that I was disappointed in many regards and probably not for the reasons that most people think. I think the movie was too much like the book. Now I know this will not be a popular opinion, but hey, I was never one for popularity contests. Here’s the deal. Having written novels, I’ve learned one thing. You don’t write with a movie in mind. Several of you just did a double take so severe I heard your necks pop from here. Screen writing and novel writing are two different beasts. Imagine if you tried to teach someone to swim. If you were writing a manual to teach someone to swim that lived in, let’s say, Alaska, where they wouldn’t have ready access to water. Your manual would like quite different from one written for someone that lived in Florida. The same goes for movies. Timing in novel writing is so drastically different. When you write, time is at your whim, you can control the flow of time, allowing it to move faster at will and slowing it down for those critical moments. While “bullet time” and other special effects allow movies to alter the state of motion of time, it does nothing to control the audience’s perceptions and feelings other than to illustrate something that a normal speeds would happen too fast for the human eye. When it comes to Harry Potter’s final movie, I felt like they tried to appease fans by staying true to the book. While this is admiral for those of us, including me, to stick with the book’s storyline, it’s not necessary to stick with the book’s pace. I feel like opportunities were list that could have brought the movie to the next level. Now, before those of you that have read this far click on the comment box, I’m not done. All-in-all, Harry Potter and the Deathly Hallows was a phenomenal movie. Could it have been better? Sure. Overall I did not leave unsatisfied, just realizing how much of an affect fans like me have on movie-making decisions. I was one of the biggest advocates for the movies being terrible because they didn’t follow the book’s stories. I then realized how difficult and impractical a task that would be. Movie making is a hard business, but in the long run, I think that they’ve done justice to J.K. Rowling’s vision. I certainly cried through the second half of the movie. Regardless of what you think and feel about the final installment, it isn’t going to affect the billions of dollars it will bring in this weekend. Until next time, keep your patronuses inside the vehicle at all times and always remember that the platform is moving at the same speed as your vehicle. Have a great evening and a fabulous weekend! ADDITION: One thing I would like to add about the movie was to comment about 3D. The last part of the movie was shown in 3D as part of the triple feature we went to and I felt like it added nothing to the movie to see it in 3D, in fact, I think I would have preferred seeing it in 2D for the first time seeing it. 3D is uncomfortable to watch, for me. It distorts the movie at times and is visually straining on my eyes. I think I would have been happier if I had just seen it in 2D. It would be helpful if you identify specific examples between the book and the movie – what worked in the book and what did not in the movie. You have an interesting thesis, but I don't see evidence yet – frankly, I found it simply amazing that they changed so much about the book – the entire sequence of how the snake dies is completely different than the book. The sequence in the Great hall with Snape speaking to the students is also completely different than the book. 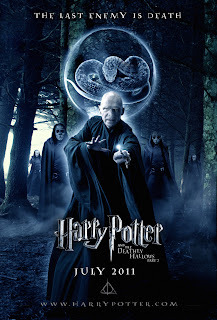 And the destruction of the horcrux cup is also different than the book – we actually go back into the Chamber of Secrets, something that did not happen in the novel. I do agree that the pace was faster in the film than in the book – but frankly again, I think this is a positive step. The film was able to achieve the sense of “epic” that the book was not able to achieve, precisely because the book was limited by Harry's personal perspective. In the film, that perspective was significantly widened beyond the narrow scope of one charater's inner world. This lent the film a great sense of an epic finish than the book achieved, limited as it was (and should be) by seeing the story as Harry's personal journey. Thanks so much for the comment and feedback! It's greatly appreciated. I'm most definitely going to have to see the movie again and read the book again to make a more detailed comparison. I was commenting more on the fact that the overall feeling while watching the movie was a bit different than I expected. I felt a few scenes could have had more impact from a thematic perspective had they been put together in a different way. The most specific example that struck me the most was the scenes with Neville and the snake, Molly and Bellatrix, and Harry's last stand against Voldemort. I felt like those three should have been more intertwined and culminated together to give a bit more to the climax. I'm not saying they were bad, or that there was anything wrong with scenes themselves or the movie, because frankly it was fantastic (especially Molly and Bellatrix), I guess I was just struck by the nuances that, watching it for the first time, felt like they could have been better. This is all just my impressions from the initial premier and having watched it as a triple feature with the first movie and the both parts of DH so it was a bit overwhelming all at once. I also find that my opinions of the movies change when I see it again because I notice things that I hadn't noticed the first time and my expectations are different after having seen it once. After it's all said and done, I really hate comparing the books to the movies. That was part of what I was trying to say in the post (of course at 3 in the morning, it probably didn't come across as well as it could have). I think the movies have been wonderful in their own right and I think that too many, my self included, expect the movies to be exactly like the book and sometimes, being too much like the book takes away from the thematic presentation. As I watch the movie again (over and over) I'm sure I'll pick up on new things and draw better comparisons between the two. The most powerful thing about the movies and the books is their ability to bring so many diverse people together to share in such a wonderful tale. Thanks again for sharing your thoughts!! !